I tap my finger on a table-top. I drink a glass of milk. I feel the warmth of the sun on my face. Such experiences seem perfectly real to me. So does the passion I have for my diesel pick-up, my grief over my grandmother's passing, or the fact that I am a Yorkshireman. Which means that, on the surface of it, my life seems real to me, through and through. Now consider what this means to me philosophically. It seems to me, therefore, that I am living in a real world. It is not imagined, or illusory. Further, it would seem to me that I am an observer of this world, not merely a “robotic” presence there. And on this basis, it would seem to me that I have a mind which observes reality: mind here, reality there, which separates my mind from the matter which it observes. If it were so simple. As to what reality really is, is another question. It is a problem which has become acute in recent generations. Three things in particular have changed. Firstly, the natural sciences have enabled us to get behind our surface impressions, to understand that the physical world is no more than it seems to be to me. Secondly, psychologists have discovered that our senses can all of them without exception be wrong: sight, smell, touch, and all. And thirdly, an increasingly materialistic outlook has led us to wonder whether there is any mind at all: the mind, said D.M. Armstrong, is nothing but the brain. What should we do, then, with the old intuitive view, which leads us to set our mind apart from matter? Since the 1950's, linguistics has been integral to the study of the mind, and it is linguistics we shall call upon here for help. Francis Bacon, four-hundred years ago, in his Novum Organum (Book 1:59), may have given us an unwitting clue as to what may be so different about the mind. There is an evil, he wrote, in dealing with natural and material things: the definitionsof these things consist of words, and these words beget words. To paraphrase Bacon, definitions consist of words, which have definitions which consist of words. This is much like having money in a bank, which has its money in another bank, which has its money in another bank, and so on. It is easy to see that one will never access one's money – which is the whole point of it after all. Similarly, our language, when we examine it closely, deals in nothings – yet nothing is the antithesis of the something that our reality is – or seems to be. There are other ways of proving this “disjunction” between our language and reality. One of these is described in my Metaphysical Notes Part III. What seems clear is that, if this disjunction did not exist, we would be mere “machines”. We therefore have a real reality, so to speak – which is however partnered with an unreal language which can never really get a grip on this reality we seem to know. The very nature of our language curiously distances our words – in fact our mental processes – from the reality which they describe. There is no real correspondence between the two. The mind, in a sense, hovers over the surface of reality. The mind is wholly other. The mind, one might say, functions in a completely different mode to the reality which we seem to know. This may well explain why we perceive our mind to be so different. It may explain, too, the many situations and states of mind which give us a sense of unreality or detachment: déjà vu, for instance, or the imposter syndrome, or a sense of alienation. As to why the mind is wholly other, and what this means, are different questions, which we may examine in time. This imaginary conversation contrasts the concepts “attention” and “consciousness”. Consciousness is of course the more familiar of the two, although nobody really seems to know what it is, let alone how to explain it. Simon Blackburn tentatively suggests: the theatre where my thoughts and feelings have their existence. Attention, on the other hand, while not as well known, is well established in psychology. 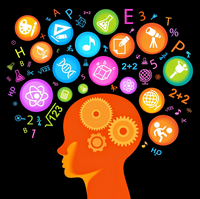 Daniel Dennett defines it as the conscious awareness of information. Could the two be one and the same? And if not, then what is the relationship between the two? Just one-hundred years ago, it first came to the public attention that we might not be as conscious as we think – and at the time, people were (and they still are) loath to accept it. Yet one should have guessed it. Our very language is replete with words which speak of our lack of conscious awareness: we are oblivious, inattentive, napping, and so on. Alternatively, we may lose ourselves in what we are doing: we are, for instance, absorbed, preoccupied, immersed. If then I am oblivious to my surroundings – or more accurately, to aspects of my surroundings – am I always conscious? Similarly, if I am absorbed in my surroundings, am I always conscious? If I am absorbed in myself, or in the problems of the imaginary world of constructs, am I always conscious? Clearly, none of these states of mind would seem to be quite the same as being fully aware, awake, or alert. There are, too, degrees of awareness. 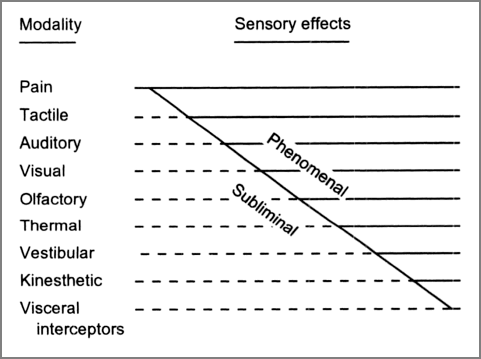 Norman Dixon famously ranked the conscious and non-conscious aspects of our sensory modalities (see the image). We easily become aware of pain, he noted. We are vaguely aware of smell. Yet we hardly become aware of what are called visceral interceptors, such as our heartbeat or breathing – even riding a bicycle, perhaps, while sending a text message. It is a hierarchy of that which, so to speak, grabs our attention. Consciousness and attention might seem to be frightfully complex subjects – yet we find a common thread which runs through all our attentive moments, if not our conscious ones. We take notice of (and sometimes we especially ignore) novelty, discrepancy, and interruption – or perhaps rather, we take notice of that which represents novelty, discrepancy, and interruption, to me. In short, we detect the “unexpected”, writes Richard Gregory. Let us pause at this point, to notice that this speaks of my taking notice, in every case, of some kind of contradiction. Novelty is a contradiction of that which I have been accustomed to. Discrepancy is a contradiction of that which I know. Interruption is a contradiction of that which I expect. Therefore, it is contradiction that arrests my attention, more than anything else. It is in moments of contradiction that I am most aware. And one does not need to see far to see that this further relates to reason – which we may explore, too, in time. In short, consciousness has a lot to do with attention – and attention has a lot to do with those things which conflict. Now combine this with the fact that the pace of modern society today is such that we need to process far more contradictions of many kinds than people used to do – many of which were not even contemplated one-hundred years ago. David Gelernter writes, with this in mind, that the modern mind is characterised by an ever more acute self-consciousness. Not only this, notes Gelernter, but previous generations were far more disposed to low-focus thought – a thought which had and has little concept of contradiction or logicality. Pre-historic societies, perhaps, were no less intelligent than we are. Rather they entertained less contradictions – and perhaps, thereby, they were happier. Part III: Reason and Contradiction.